They were accompanied by a tremendous crowd of Christians, loudly offering praise. 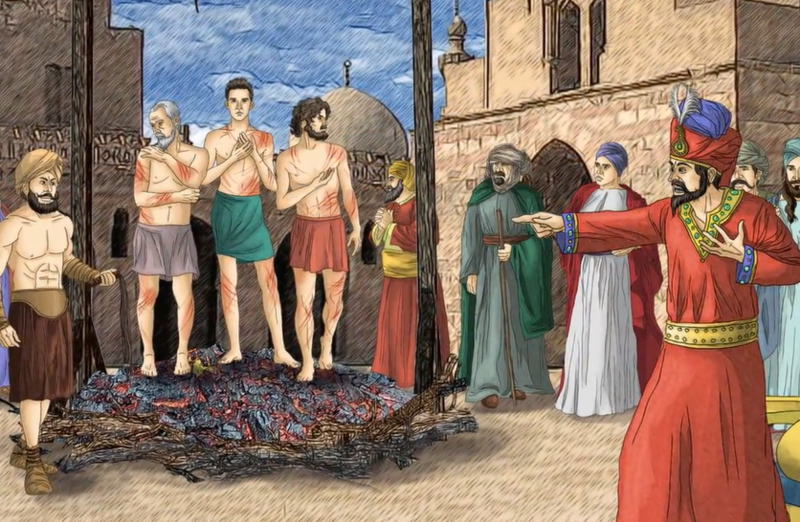 The holy martyrs, together with the king's mother, were burned at the stake. On the orders of King Sapor, 7,000 Christians who followed them in the procession were also put to death. A popular Russian Orthodox Christian TV station called "Союз" offers videos for children, teaching the lives of the Saints. They tell the true stories of Christians throughout history, who have lived their lives faithfully for Christ, and in many cases have died for Him. At the beginning of the first millennium A.D., lived Saints Acindynus, Pegasius, and Anempodistus. They were secretly Christians, because they were courtiers for the Persian King Sapor II, a terrible persecutor of Christians. about their faith in the Holy Trinity. The furious king ordered them to be whipped, to beat all the faith out of the traitors. The torturer became tired, and another torturer took his place, and the holy martyrs stood under all the blows, unto the glory of God. Whether from stress, or from fear, the king fell down, unconscious. Everyone thought he had died. From the pillars, the suffering men called out to God, and King Sapor came to himself. But the king learned nothing from the miracle. The king accused the martyrs of witchcraft, and ordered that they be hung over a fire, in order to suffocate them with smoke. They prayed to the Lord. The fire went out. And behold: they stood free from bonds and unharmed. Sapor was blinded, and he started to insult the name of the Lord, and the martyrs could not bear such blasphemy. They proclaimed, "Let your mouth be without a voice." And the king was stunned into silence. Frightened, with rage and malice, the voiceless king Sapor tried to give an order to throw them in the dungeon, but nobody understood him. The king went into a seizure. The saints pitied him, in the name of the Lord, and he was released. But truly, a darkened soul does not see anything. The king did not understand the miracles, and he ordered the torture of the martyrs to continue. The people, unlike the king, saw the power of God, and along with the martyrs, they believed in the power of God. The executioner who had tormented the saints, and even the king's mother, told of their faith in Christ the Savior. King Sapor realized that the saints were not scared of being tortured, and the number of Christians continued to grow. So he ordered them all to go to the place of execution, and to be killed. Acindynus, Pegasius, and Anempodistus were accompanied by a tremendous crowd of Christians, loudly offering praise. The holy martyrs, together with the king's mother, were burned at the stake. On the orders of King Sapor, 7,000 Christians who followed them in the procession were also put to death. November 15th is the day for remembering the holy martrys Acindynus, Pegasius, and Anempodistus.